Magnet advertising has emerged as a worthy alternative to print and media advertising. Today, promotional magnets are preferred by businesses of all sizes and budget types for improving their business visibility. Today, it is possible to find custom magnets in almost all shapes; still, there is high demand for customized rectangle magnets and square magnets because they are considered authentic. Large promotional magnets 4×7 rectangle magnets are becoming a choice for many businesses, wishing to improve their brand visibility. Many businesses have already found benefits by employing customized 7×4 magnets for awareness building. Here are some brilliant promotional magnets crafted on this magnet size. Picture frames make the indulging gift choice for everyone and people would easily love them. Gifting a picture frame fridge magnet is a perfect way of buying a customers attention. People would be drawn to it and your picture frame fridge magnet will easily capture a prominent space over their refrigerator door. However, picture frame fridge magnets are largely preferred for individual gifting or setting mood for a celebration, but several businesses and campaigns have benefitted from it. Large picture frame magnets introducing a candidate is becoming a popular sight around US. Most recipients love retaining picture frame magnets over their refrigerator doors. Customized magnets printed with first aid or safety information is another head turner and many people prefer to stick it to visible spaces in the house. Refrigerator calendar magnets are perfect for businesses because they offer 365 days of non-stop attention. People would refer them and discuss them every single day. This type of advertising suits all local businesses, which have started with a limited resources, still wish to attract a loyal customer base. Full color refrigerator calendar magnets are sure to become an asset to your campaign. Save the date sales flyer magnets are largely preferred by many start up and established businesses to promote their mega sales event. The value advantage offered by these customized magnets is that they can highly influence anyone with their largesse attitude and quality (if you are buying them from an ecommerce store stocking made in USA magnets). People would be happier to receive business information, which they can ultimately retain as a refrigerator art. 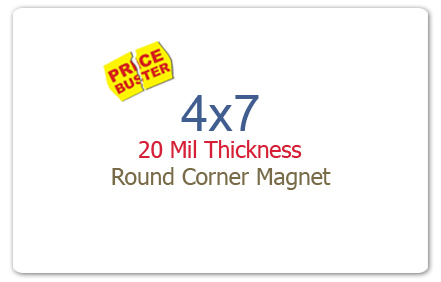 These lively full color magnets can be mailed to homes of your existing customers and prospective customers. Who doesn’t like a sport in America? Perhaps everyone is inclined to one or the other sport and they would do anything to stay updated about their favorite sport. Sports schedule magnets 4×7 are perfect for promoting a sports team, sports store, sports sponsorship, etc. Whether it is promoting a local team or a national team, these customized sports schedule magnets are sure to make impressions on the crowd. Customized magnets 4×7 magnets -30 MIL are perfect choice for businesses, which wish to announce their business during their drive. This tactic has helped many businesses, which failed to make right impressions at the right time. It costs just a fraction of the total price; they have been spending on other outdoor advertising mediums to excel with these customized magnets. These custom magnets 4×7 would easily show up during a drive or from parking lots, etc. 4×7 magnets leave enough room for experimentation and exploration and businesses can utilize it for building value for their businesses.